In 1966 Blaine Lundquist built a greenhouse structure that comprises the main greenhouse of the Garden Gate Nursery. At that time, this location was out of the town of Rigby along State Street. The greenhouse was constructed to raise hydroponic tomatoes. This operation continued for several years and in 1972 Blaine’s sister and husband, Richard and Joyce Polson purchased the nursery. They called it Queen of Hearts Nursery and changed the crop from hydroponic tomatoes to bedding plants, garden vegetables, and a few trees and shrubs. 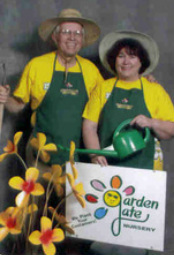 In 1994 the Polson’s retired and sold the property to Richard and Mary Ann Hoffman who continued the production of bedding plants, garden vegetables and other spring plants. The nursery was renamed, “Garden Gate Nursery.” Early in the spring of 1998, my wife Prudy, stopped to purchase some of their good planting soil. Not only did she buy soil, we ended up buying the nursery! We, also, were able to purchase property lying east of the greenhouse which belonged to the Polson’s. As time went by, we expanded and built another greenhouse on the east property. We continue to grow the nursery. Presently we have three greenhouses at our home location in Grant, Idaho and shuttle the product to the Rigby greenhouse for sales. In 2008 we built a new, modern storefront on the east property and now make our entrance from the Annis Highway instead of State Street as it had traditionally been. We are grateful to our many customers that come from year to year to our little business. We honestly try to do our best to supply you with good, healthy plants and sincerely hope that you find joy in the miracle and the beauty that new plant life generates within us each year.